It’s always exciting announcing a new season! After months of deliberation and negotiations, we codified a long wish-list into the final package of titles that will find life on our stages. Our 2018-2019 Season represents a broad spectrum of theatrical choices from the recent to the golden age of the Broadway musical. 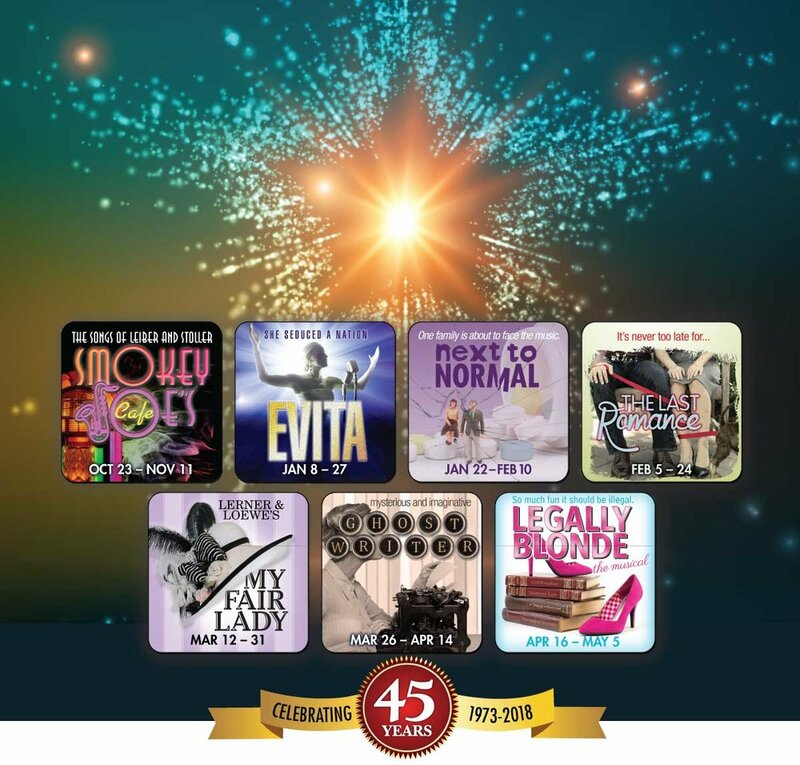 On our Mainstage, a particular highlight of the season will be the back-to-back productions of Andrew Lloyd Webber’s first mega-hit, EVITA, followed by one of the all-time great favorites of the musical stage, Lerner and Loewe’s, MY FAIR LADY. Adding to the Mainstage experience are the chart-topping songs from the fifties and sixties by the hit writing team of Leiber and Stoller, with their high struttin’ revue, SMOKEY JOE’S CAFÉ. For those of you who love a good play along with the big musicals, we’ve found a little jewel about finding the spark of love near the end of life’s rainbow, in Joe DiPietro’s, THE LAST ROMANCE. And, to end the Mainstage season, we’re joining forces once again with Walnut Street Theatre to produce the jubilant Broadway musical based on the hit movie, LEGALLY BLONDE. On the intimate Waxlax Stage, we’re mounting one of the most compelling musicals of recent years, the Pulitzer Prize winning, NEXT TO NORMAL. Critics have called NEXT TO NORMAL one of the best musicals of the 21st century, and viewing it in the confines of the WAX should be a remarkable theatrical experience. Also, in the WAX you’ll be able to engage in the fertile mind of playwright Michael Hollinger’s, GHOSTWRITER. This is a play about the meaning of truth and should have our audience debating the meaning of that very timely question long after the curtain falls. I hope you’ll plan on joining us next season as we celebrate our 45th season here in Vero Beach. Subscribe now for the best seats in the house! Waxlax Stage pre-season discount pricing is good through June 4, 2018. There is an additional $3 processing fee per subscription. 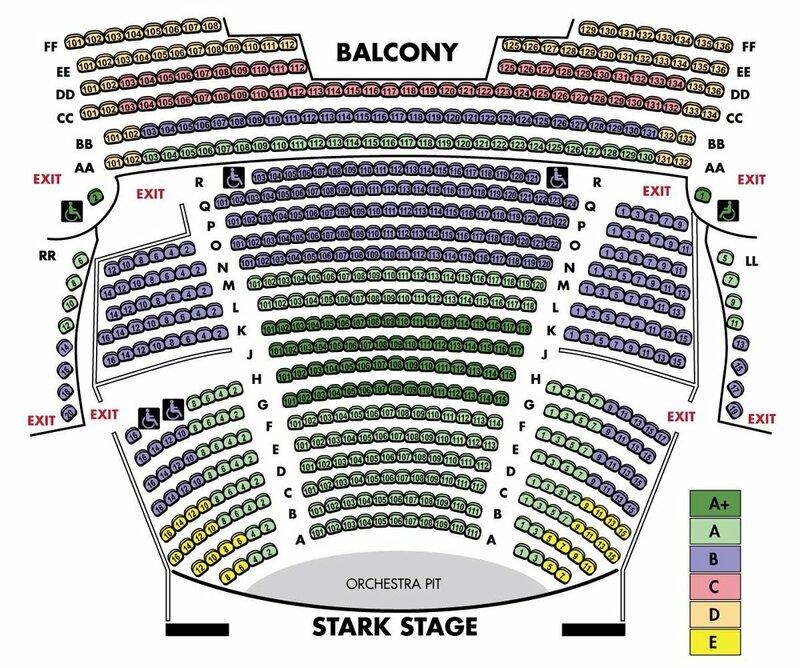 All prices and shows subject to change.Some seats require the use of steps. Call the box office with any questions. Riverside Theatre produces large musical productions and plays on The Stark main stage. It has a seating capacity of 692. "A rock n', toes tap n' musical revue"
"It's never too late for..."
A contemporary showcase for new or Off-Broadway shows, productions on the Waxlax Stage are modern, thought-provoking, and an intimate and compelling experience at Riverside. Second Stage productions are potent examples of the power of theatre to engage an audience through the combination of great scripts and masterful acting. The Waxlax Stage can seat up to 250. "One family is about to face the music"
4. Purchase season tickets Online (phone orders only after August 28, 2018). To renew your same Seats and Performance Days/Times (“Seats”), go online and log-in to your account, call, or visit the Box Office! Your Tickets will be issued immediately. If you do not renew your Seats prior to March 14, they will be RELEASED to the public. Purchase in advance and be placed at the top of the list for the best available seats prior to New Season Ticket sales on March 26 (wait list sales are refundable). Again, we encourage you to renew your current seats prior to March 14, to guarantee that you have your current seats, should an acceptable change not be available. NEW SEASON TICKETS ON SALE: MARCH 26, 2018 until while they last! New Season Ticket purchasers can select Seats and Performance Days/Times based on availability. Tickets will be issued immediately. BE TREATED LIKE A VIP, ADD A MEMBERSHIP TO YOUR SEASON TICKETS! VIP Hot Line & Entrance! Earn Free Drinks & Tickets! Other VIP Perks!